The Oxen of the Sun: Murakami's new novel IQ84 to be released this week in Japan! 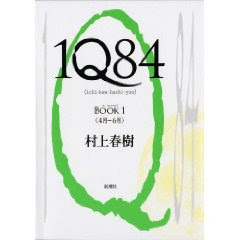 Murakami's new novel IQ84 to be released this week in Japan! Murakami's new novel, IQ84, is due out this week in Japan. Very exciting news, as its been about five years since US readers have had a long-form Murakami Novel (Kafka on the Shore). In Japan, IQ84 will be released in two-volumes, each spanning just over 500 pages. I'm not sure how long this means an English version will be, but I'm looking forward to hearing details as they emerge. I've read that Murakami's novel is to be somehow related to 1984, as the letter "Q" in English is a homonym to the number 9 ("kyuu") in Japanese. Or so I'm told! Below are the Japanese covers for each volume. Yes, that's correct-the number 9 in Japanese ("kyuu")is pronounced almost exactly the same as the letter 'q' in English. Hello, I am a Japanese woman and am really interested in your blog. Now the book has been published and has already a big hit. So I'm now thinking of reading this, although I have never read Murakami's book before. I have read "Tuesdays with Morrie", which really moved me so much. Anyway, I am looking for nice books to read, so I am very excited to check your blog. Thank you. thanks so much for your comment! I'm sure the new Murakami will be a huge hit over in the US as well. I'm thinking this blog will evolve into featuring a bit more recommendations on top of showcasing collectible pieces. Stay tuned! Again, thanks for reading and leaving a comment! Have you read anything by Christian Oster? His book, In the Train, seems similar to Murakami's writing. Hi Jack-- thanks so much for the recommendation. I've never heard of Christian Oster but I will most certainly check him out. Would you recommend any other titles? I wouldn't compare Oster with Murakami, but his books are wonderful. After In the Train (already my favorite of his), I would recommend The Unforeseen, and My Big Apartment. The Cleaning Woman (also a film) is also quite good.